I recently read a great article by Chrys Napolitano about rising to the challenge of staying locavore during the winter months. Recognizing urban local winter eating as neither easy nor haphazard, she relayed a few simple rules in Edible Bronx for practicing the sustainable philosophy. First and foremost, plan ahead. Her article was riddled with tips for freezing, pickling, and dehydrating late autumn produce. As we’ve clearly missed the boat on this one, I’ll relay two principles that stuck with me and are actionable right now. First, know what’s in season. For New Yorkers, cabbage, cauliflower, root vegetables, winter squash, dried beans, apples, pears, arugula, baby spinach, and baby kale are produced steadily throughout the winter. Did you know that just shy of two dozen GrowNYC Greenmarkets are open year-round? Second, accept that compromise is ok. Certain produce, such as citrus, avocados, nuts, and olives, will never be local in the tri-state area. “Don’t sweat it!” Chrys emphasizes. 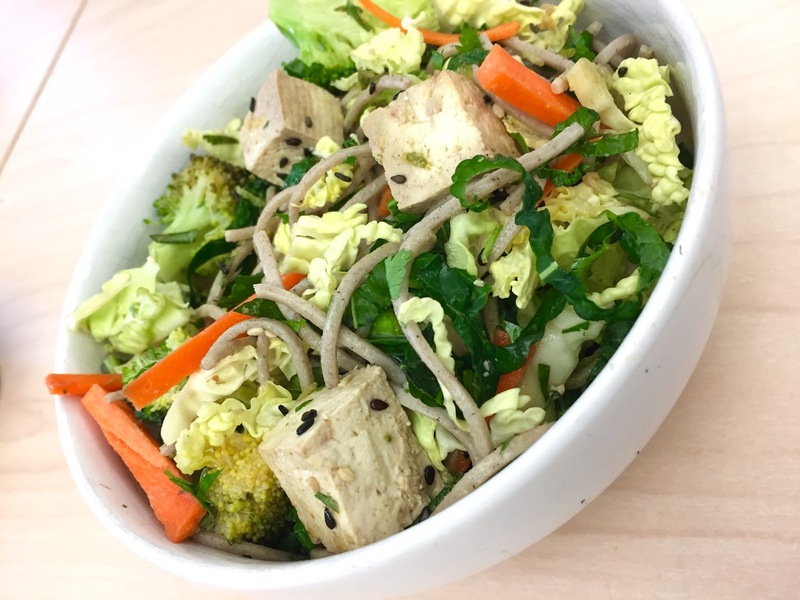 Noted, and the perfect segue into this Citrus Ginger Tofu Salad with Buckwheat Soba Noodles recipe. Starting with local kale, carrots, and cabbage, this salad boasts an A+ on the nutrient and crunch scale; broccoli florets contributing to the attractive texture/nutrition profile, too. Add delightfully smooth, earthy soba noodles and crisp tofu squares— enveloped in an Asian citrus dressing that hits every flavor nuance imaginable—and this salad is simply sensational. 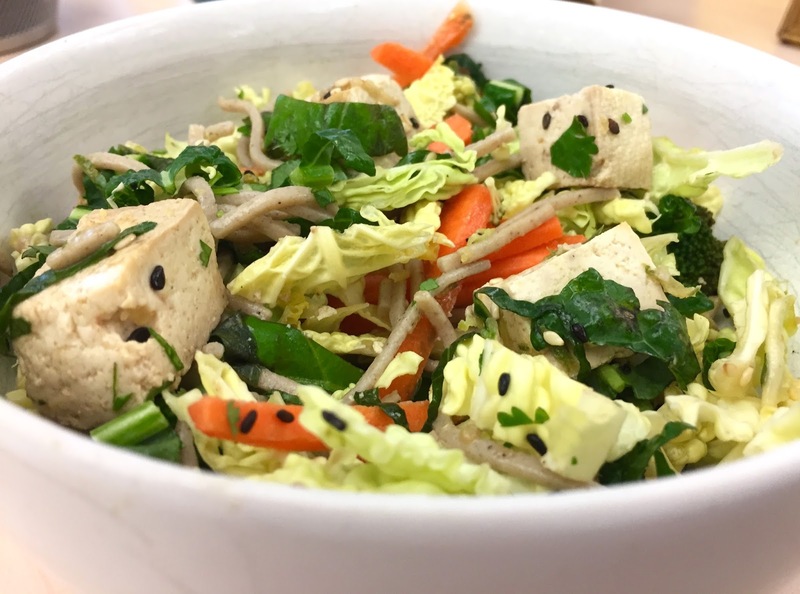 The marinade for the tofu consists of orange juice, soy sauce, sesame oil, ginger, garlic, maple syrup and cayenne and is repurposed for the salad's dressing; perked up with added citrus and acidity through lime, rice wine vinegar, and extra orange juice. 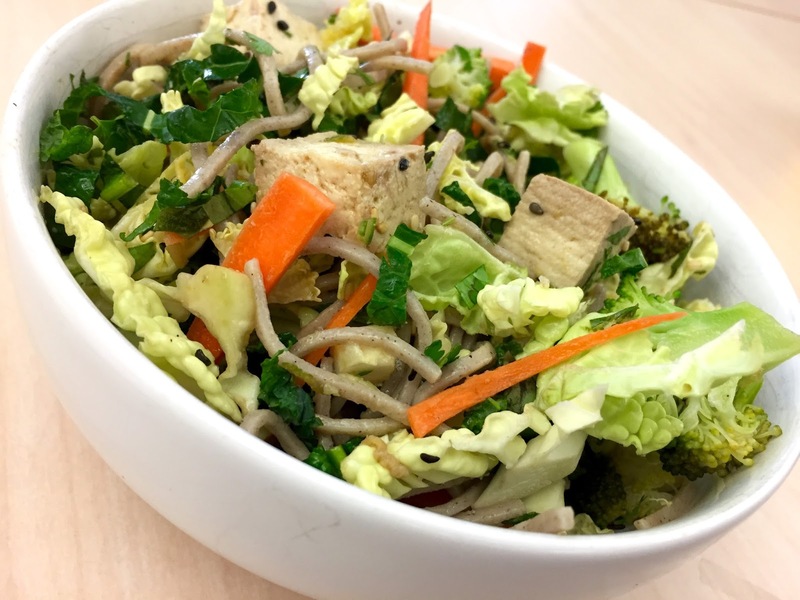 Garnished with basil, cilantro, and sesame seeds, the salad is sprightly and animated; a triple-the-recipe dish for sure. I’ve made this salad a few times, once substituting chicken breast for tofu, which works just as well. I definitely recommend doubling or tripling the marinade/dressing, as if you are like me— using the entire bunch of kale and whole head of cabbage because it's there, that is—your salad will be underdressed. 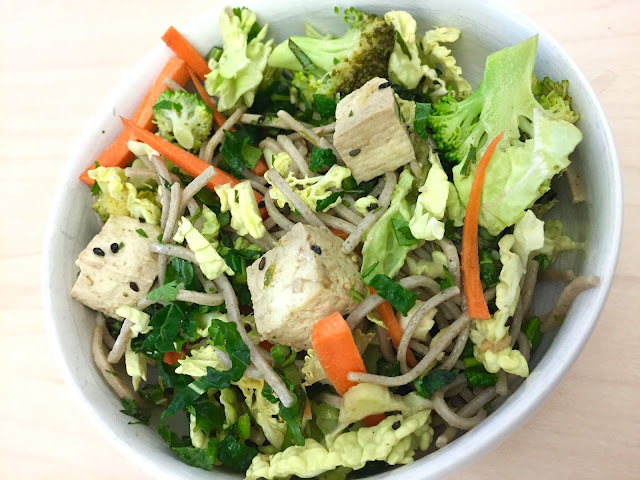 A quick note: 100% buckwheat soba noodles (which make this recipe gluten-free, in addition to using tamari instead of soy sauce) are expensive, about $8.99 a package. However, combination buckwheat and regular wheat noodles run at a much more reasonable price point, comparable to regular spaghetti. So while native citrus will always be a no-go in the Empire State, you can reduce food miles by aiming for domestic citrus rather than that grown in South America. Florida is in citrus season right now. We’re just in cold and flu season, so I’m thinking it’s definitely a good time to get a healthy dose of that vitamin C. Plus, simply being locally mindful—even if you’re not practicing with diligence—counts for something, for sure. 1. Preparing the Tofu + Marinade: Preheat the oven to 350 degrees Fahrenheit. In a bowl mix together orange juice, tamari, sesame oil, olive oil, ginger, garlic, maple syrup, and cayenne and set aside. Cut the tofu into 1-inch cubes and place into a small baking pan without overlapping. Pour the marinade over the tofu. Put the tofu into the oven and bake for 15 minutes, stir, and bake for 15 minutes more until browned. With a slotted spoon, scoop out the tofu and place onto a plate and allow to cool. Pour the remaining marinade into a bowl and set aside. 2. Preparing the Thai citrus vinaigrette: Add the lime zest and juice to the remaining marinade. Continue to add the orange juice, rice vinegar, and sea salt to taste. Set aside. 3. Preparing the salad: Cook the soba noodles as described on the package, rinse with cold water and set aside. Meanwhile, bring a small pot of water to a boil, and blanch the broccoli florets for 30 seconds. Immediately strain the florets and rinse with cold water. 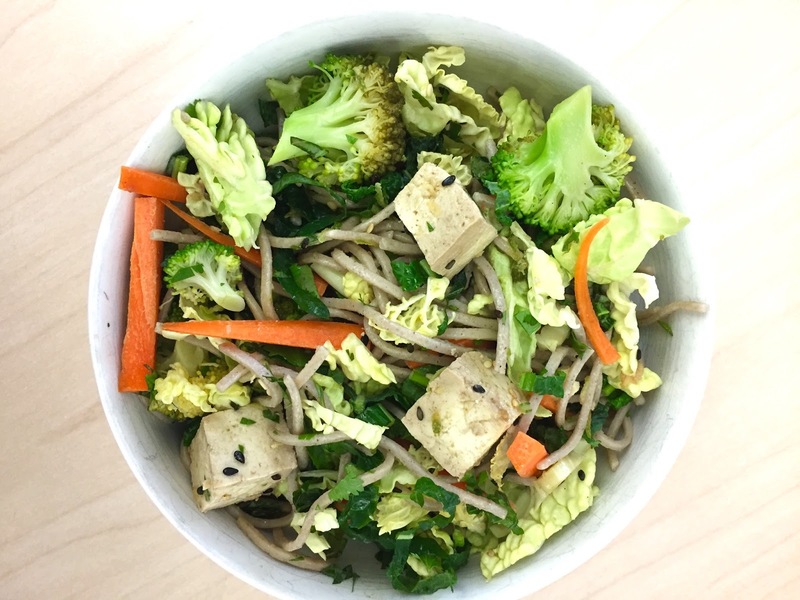 Put the noodles, blanched broccoli florets, carrot, kale, cabbage, cilantro, basil, and sesame seeds into a large bowl and toss. Dress the salad with the Thai citrus vinaigrette. 4. Serve the salad topped with baked tofu and garnished with sesame seeds (and peanuts, if desired). *Optional. De-ribbing kale takes so long, and in my book, no one notices the absence of said ribs except yourself. Skip if you're crunched for time.